NEW YORK, NY--(Marketwired - Oct 26, 2015) - Atlantic recording artist Kwabs has announced release of his much-anticipated North American debut EP. "WALK" is available now at all DSPs: http://smarturl.it/KwabsWalkEP_US. "WALK" is highlighted by the acclaimed single, "Walk (Feat. Fetty Wap)," a new remix of Kwabs' worldwide #1 hit, "Walk" (see below tracklisting). The song -- available now -- was recently hailed by SPIN, which noted "'Walk' has already been a hit in international markets, but Fetty gives it the swirly, disorienting, and infectious treatment that he's given all of his best work to date." "The British soul singer and the New Jersey emcee trade vocals back-and-forth in this compelling new rendition," declared Hypetrak, "and you're bound to hear this replaying on the radio in the near future." "Walk (Feat. Fetty Wap)" can be heard now via Kwabs' official YouTube channel, kwabsmusic. 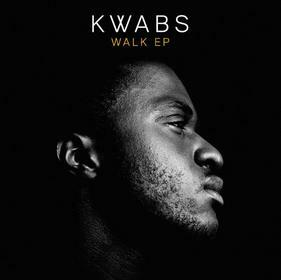 "Walk" proved an international breakthrough for Kwabs upon its original release last year, instantly establishing the London-based singer/songwriter as a major new star. The track was a chart-topping sensation in Germany, Hungary, and Romania as well as a top 5 smash in Austria, Belgium, Czech Republic, Greece, Poland, and Switzerland, earning platinum certification in Germany and gold in Austria and Switzerland. "Walk" -- featured in EA Sports' hugely successful "FIFA 15" video game -- is accompanied by an equally popular companion video. The clip has already drawn 85 million individual views via YouTube and is streaming now at http://smarturl.it/Kwabs_Walk_Spotify and kwabsmusic. Kwabs has fast become one of the planet's most popular new soul stars, applauded around the world for his powerful baritone and cinematic synth-fueled hooks. Born Kwabena Sarkodee Adjepong, the South London native's exceptional musical gifts earned him a place as lead singer of the UK's renowned National Youth Jazz Orchestra followed by acceptance into the prestigious Royal Academy of Music. In 2012, Kwabs posted a series of unique online cover versions that quickly became viral favorites and led to his joining the legendary Atlantic Records roster. A trio of EPs drew major airplay and critical attention, with Kwabs ranked among BBC Music's massively influential "Sound of 2015" poll and featured in such high profile media outlets as Buzzfeed, The Guardian, The Observer, and Time Out. Kwabs' full-length debut album, "LOVE + WAR," arrived in the UK last month and was greeted by unadulterated applause, with The Guardian commending it as "a fine showcase for Kwabs' breathtaking technical skill and emotive heft." The Independent's Andy Gill noted the "the warm, intensely human timbre of Kwabs's voice held in prickly equilibrium with the chilly electro arrangements of producers like Sohn and Dave Okumu." Perhaps The Line of Best Fit summed it up best in its 9.5-out-of-10 rated rave: "This is the best pop music in the UK right now." An electrifying live act, Kwabs has spent much of the past year on stage, including festival appearances, TV performances on such programs as BBC Two's Later...with Jools Holland, performing on Sam Smith's full Spring 2015 European tour and a just-wrapped headline tour of the UK. As if all that weren't enough, Kwabs recently teamed with Disclosure for "Willing & Able (Feat. Kwabs)," found on the GRAMMY® Award-nominated duo's much anticipated new album, "CARACAL." For additional information, please visit kwabsmusic.com, www.facebook.com/KwabsOfficial, twitter.com/kwabs (@kwabs), and www.atlanticrecords.com.